Everyone is welcomed at reception. Story time at the Early Years Project. 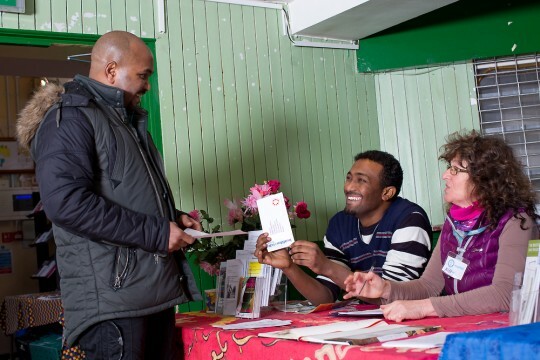 A hub for asylum seekers and refugees in Bristol. Our mission is to welcome asylum seekers and refugees in Bristol. Together we create a place of solidarity and trust. We challenge the injustices that we experience and witness in the UK. Learning from each other we develop partnerships and links with the wider community to promote equality of opportunity for asylum seekers and refugees. Our ethos is rooted in building trust & friendship. The Welcome Centre offers a comprehensive range of services: a social space to talk, have refreshments, engage in creative activities & games, asylum support to prevent destitution, advocacy & information, English & computer classes, educational trips, training and support in interpretation & public speaking, a volunteering programme, an Early Years Project (EYP), opportunities to get involved in musical events,campaigning & awareness raising. An average of 79 people use the services of the Welcome Centre each day. 83% of members (service users) said that coming to the Welcome Centre makes them feel much better. Member's comment: "When I first came to BRR I was lonely and didn't know how to change my situation. Volunteers and staff here helped me get the information I needed. I joined an English class and went on trips that helped me learn about the UK and feel better." Volunteers are vital to BRR and enable us to operate - our volunteers welcome and befriend, teach English, carry out advocacy work,run the kitchen, run campaigns and so much more. See website for further details. pays for a bag of food and toiletries for a destitute asylum seeker. pays for a child to attend an EYP session whilst Mum gets essential help. pays for a meal for 55 people; it maybe the only cooked food that week.